Have you ever wondered where in the world Macs are the most popular? We have, so we decided to find out. To do this, we examined OS market share numbers from across the world to identify the countries where Mac OS X has the highest market share. You’d expect the United States, Apple’s home market, to lead the pack, but it’s not quite that simple. We looked at desktop OS market share data from StatCounter, which is based on visitor stats from more than three million websites. To get up-to-date numbers, we focused on the month of February, 2011. Doing this, we ended up with the following top 10 countries in terms of Mac market share: Switzerland, Luxembourg, the United States, Iceland, Canada, Australia, New Zealand, Norway, Denmark and Singapore. 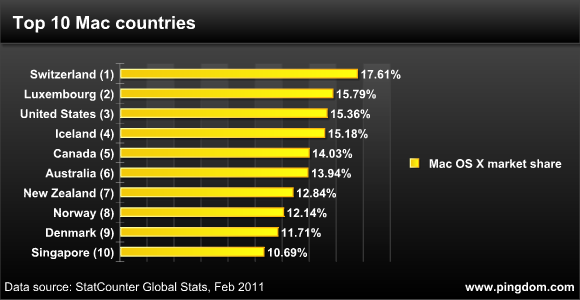 Above: Top Mac countries based on the OS market share in each country. Just outside the top 10 you find countries like Sweden, Japan, the United Kingdom, France, Belgium and Finland. Now that we’ve looked at the Mac market share in individual countries, what about the market share in the different world regions? Here it turns out that the United States makes a comeback. North America comes in at number one, closely followed by Oceania, then Europe as a distant third. 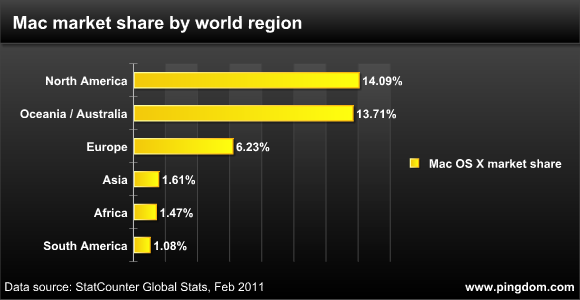 The Mac has less than 2% market share in Asia, Africa and South America. Above: Top Mac regions based on the OS market share in each country. 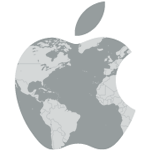 Another observation we’d like to add is that, as a subregion of Europe, Apple has made a very good impression in the Nordic countries. Three of the top 10 countries are Nordic, and all five Nordic countries are included in the top 20. With the massive success of Apple products like the iPod, iPhone, and lately, the iPad, it’s sometimes easy to forget that Apple also sells personal computers. Apple’s Mac computers have never dominated the market in the same way, always being a distant second to Windows-based PCs, but they do sell well, and have become increasingly popular lately. Now, after this post, you know where Apple has been most successful in building its Mac user base. 5 Nordic countries? Norway, Sweden, Denmark, Finland aaand? Iceland? I think if you would divide Europe into East and West would would get numbers that look like North and South America. Pretty misleading stats. Switzerland has a tiny (and rich) population. What about showing the actual numbers as opposed to a percentage? For example if Switzerland has a million PCs this means there are 176,100 macs. If the UK has a 10 Million PCs, and has a market share of just 1%, it still has far more macs. What position would Belgium be then ? And with which percentage ? Well it’s no surprise that Singapore is listed. Come to this country and see almost everyone staring into an Iphone at every turn! It’s scary and overrated somehow. The country is so small yet it still rank 10th. I was already with Mac during the days it was being scrutinized & climbing the market here. Now, talk about affordability & publicities, everyone’s rushing for a Mac OS or at least an Ipod. Pfft….converts. I just love apple. If their prizes were lower, more people would have bought it. Most people think about iphone, ipod, ipad when they hear about apple, but most of all they make incredible computers and OS. Actually mac isn’t that expensive, cause it last longer. I have many macs, and one is twenty years old and still working, one is 12 years old and still working.. Had no problems with any mac. Friends with pc often have problems and must buy new one twice as often as me. Mac=Quality! blogprince, the rating list is for percentage of users not how many users. So the statement “The country is so small yet it still rank 10th” is incorrect. If anything, small population size has the potential to cause even bigger (and smaller) per capita percentages due to the smaller sample sizes. It would be much harder for the US to increase its market share by 1% than it would be for Singapore to do the same.